Receptor composition for cytokines signaling via the β-receptor subunit gp130. 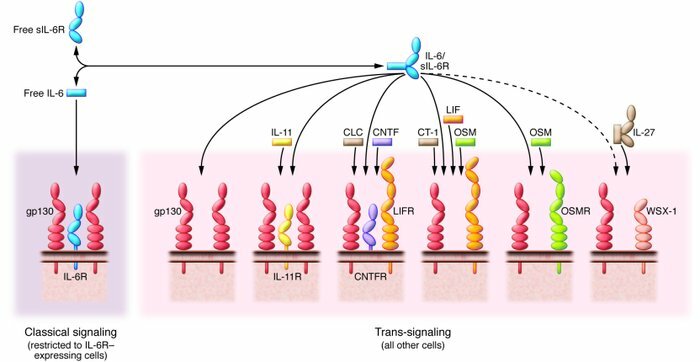 gp130-related cytokines (IL-6, IL-11, IL-27, CNTF, CLC, CT-1, LIF, OSM) bind membrane-bound receptor complexes, which all contain the receptor subunit gp130. These cytokines have diverse functions, not limited to but including the induction of acute phase response protein expression; lymphocyte activation; cytoprotective actions on cardiomyocytes, neuronal cells, and hepatocytes; bone metabolism; hematopoiesis; and liver development and regeneration. IL-6 trans-signaling through the IL-6/sIL-6R complex can fulfill functions of other gp130 cytokines, including blockade of embryonic stem cell differentiation. In addition, since gp130 is expressed in all cells of the body, the IL-6/sIL-6R complex can stimulate cells in additional tissues, which do not express IL-6R, LIF receptor (LIFR), OSMR, IL-11R, CNTF receptor (CNTFR), or the IL-27 receptor subunit WSX-1.